It’s been referred to as “Lethal” and compared to smoking for its negative health impacts. It is something you likely do every day, and most people don’t realize that damage it does. Believe it or not, the latest research points to sitting as a major risk factor for a variety of health problems. If you’ve been a patient at BCA for very long, you’ve likely heard us recommend you get up out of your chair as much as possible. Many people are aware by now that sitting is hard on the low back. The longer we sit, the more disengaged the muscles that stabilize your spine become. This can leave your spine vulnerable to injury when you finally stand up and place any kind of demand on your back. While chiropractic adjustments and appropriate exercise can reduce some of the negative impacts sitting has on your spine, there is another aspect of too much sitting that is perhaps not as well known, and may prove to be more damaging to our health. Dr. James Levine, a researcher with the Mayo Clinic performed some eye-opening research on the subject. The full New York Times article here goes into more depth and I have summarized the takeaways for you below. Poor blood sugar control leading to diabetes. Increased risk of various types of cancer. The connection may not seem surprising to most of us, but the alarming part is that we cannot eliminate these elevated risks simply by exercising (You can’t exercise your way out of bad habits). For example, I cannot sit for 8 hours at work, then go to the gym and “undo” all that sitting. 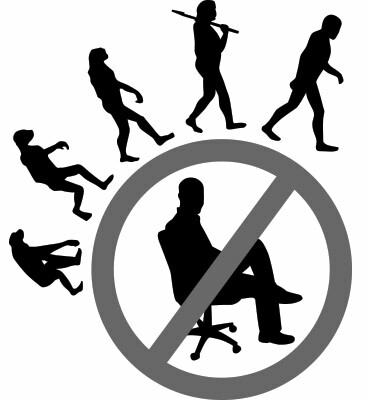 This is largely due to the fact that when we are sitting we aren’t moving the way the human body was designed to. Energy expenditure (burning calories) goes way down as our metabolism slows due to this lack of movement, leading to a host of health issues. To think of it another way: You can’t smoke a pack a day and hope to undo all the damaging effects of smoking by going to the gym for an hour. So what do we do about it? Unless you are fortunate enough to have a job that allows you to be productive while moving around all day, most people need to be at their desk for the majority of the day. Here are three simple ways to combat sitting. Get a standing workstation – You’ll find that standing throughout the day causes you to move more, shifting weight leg to leg, walking across the room etc. Get up every hour – If you’re unable to obtain a standing desk, make sure to get up for 10 minutes every hour. This can fire up your metabolism again, and reduce the stress on the lower back by re-engaging those important spine-stabilizing muscles. Sit less away from work – Make a point to sit less when you’re not at work. Avoid the temptation to park it on the couch for 3 hours after a day at the office. Get out and go for a walk on your lunch break, take the stairs instead of the elevator, and don’t take the parking spot closest to the store or office. The bottom line is that small non-strenuous movement throughout the day adds up and has a dramatic impact on calories burned, improving metabolism, and improving overall health. As an added bonus, you may notice that lingering holiday weight is a thing of the past. So you think you sit less than 8 hours a day? See how fast it adds up, you’ll be surprised! Ask your chiropractor at BCA for more information on this research and other easy tips on avoiding the pitfalls of sitting.